This spicy curry goes well with rice, chapatti, idiyappam, appam, etc. Easy to prepare within 15-20 minutes and is absolutely tasty. 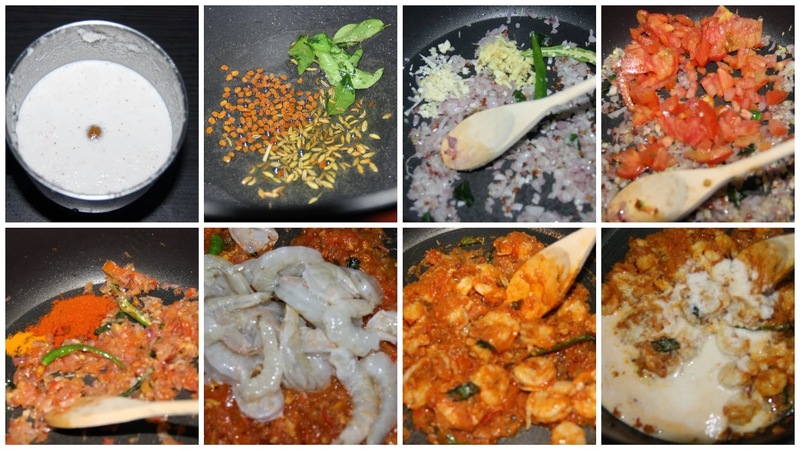 The red chilli and green chilli cuts the sweetness of the prawns and make perfect spicy curry. Whereas coconut milk balances the spiciness of the prawn curry. For people who love your curry to be extra spicy, you can cut down on the coconut milk. Pour oil in the pan and add mustard seeds. When it splutters add fenugreek seeds, fennel seeds, dry chilli and curry leaves one by one. Add onion and green chilli cook till translucent pink colour. Then add ginger and garlic when raw smell leaves add tomatoes and cook for 2-3 mts. Add salt, turmeric powder, chilli powder and little water. When it comes to boil add the prawns. Cook the prawns for 2-3 minutes. Then add coconut milk bring it to boil and add coriander leaves along-with curry leaves. Do not over cook the prawns because it tends to become rubbery. Note: people those who are health conscious avoid the coconut in this curry. looks so creamy and easy to make...yummy curry..
My favorite. Curry looks colorful and tempting Love to have with hot rice. First time here. Glad to follow you..Visit my blog when you get time. My family's favorite prawn thokku ,Relishing & tempting.